In this community we invite you to engage in ministry alongside others so that you may come to know and appreciate God’s life in theirs. We envision of a world in which God’s transforming love is lived, shared, and celebrated by all. Join us in our mission to bring this world about! 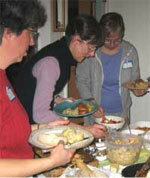 The Episcopal Church Women meets five times a year on the second Thursday of the month. Our meetings are held in October, November, February, March and an April business meeting devoted to the Cloud 9 Grants for the year. For specific information on our monthly meeting please see the monthly church Bulletins and the E-Messengers. Women of St. Stephen’s, save the dates of November 2-4 for our Women’s Retreat! Please down load this information packed brochure and registration form. Contact Nancy Goodno for more information. The Men’s Retreat will be held Saturday March 23, 2019. This is a one-day retreat led by The Rev. Lucas Mix on the topic of “The Soul: Life in Body, Mind, and Spirit”. Download the Registration for Men’s Retreat 2019 form or pick one up in the Narthex or by email from bob.blossey@gmail.com. Send your registration forms in to Neil Munson neil@ststephens-seattle.org at St Stephen’s. You may join up to the last minute, but please sign up promptly as we would like to have a count by the last week of February. Bring your friends as well! There is much to be gained for all. Here’s your opportunity to meet other members of St. Stephen’s and get to know them in meaningful and wonderful ways! Download a sign-up form & turn it in to the church office. Groups will be 6 – 8 people, meeting at times decided by the group members. These fellowship groups provide an informal setting for members to become acquainted, sharing their backgrounds and experiences, and developing enduring relationships. Questions? Contact The St. Stephen’s office. The Men’s potluck Breakfast will be at 8 am September 13, 2017 in the Parish Hall Kitchen. This was previously scheduled as a dinner, but our program will not be available at that time. It will be rescheduled for the Men’s Dinner on December 13, 2017. The truth is that the men of our church are gifted in diverse and wonderful ways. We owe each other the opportunity to really get beyond just a nodding acquaintance. That is why we formed the Men’s Breakfast Group. At present, it is a potluck with everyone bringing something to share. We usually have more than enough to feed double the number who come, and average about 8 members each month, with a total group of about 30. Deep friendships have emerged from these breakfasts and our annual retreats. We circulate the E-Mail newsletter every month, which is a terrific reminder of our breakfast together. Our activities include potlucks, hiking, craft nights, theater outings, bonfires, kayaking, biking, dinners at ethnic restaurants… anything fun that we can think of! 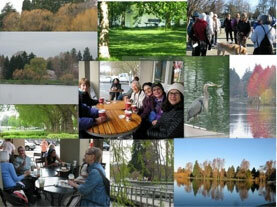 Everyone is invited to participate in Walk Around Greenlake (WAG) “First Friday” Walks! WAG is open to all women and we would love to have you and your friends join us for our first Friday walks. 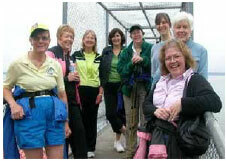 All women ages 18 to 118 are warmly invited to join us for fun our funwalk once a month at 8:55 AM. We walk at Greenlake Park on the path near the community center and walk counter-clockwise. Join us for the walk and/or coffee afterwards at Starbucks. Anyone is welcome regardless of St. Stephen’s membership. We hope to see you there! To find out what we’re up to this month, or to get on our email list, contact us at the parish office. See you there! The gardens on the church grounds are planted and maintained by members of the Guild with generous support from donations and memorial gifts. Planting events happen several times a year on Saturday mornings, with lunch included. Come join us, and have some fun planting!